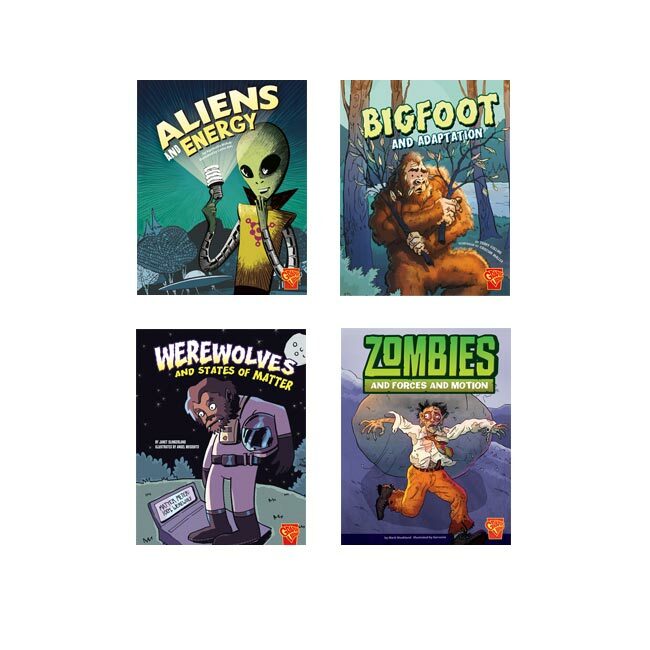 This set offers a creative way to use zombies, werewolves and vampires to teach science. Each book presents an engaging, hilarious, and absolutely fact-filled look at important scientific concepts. 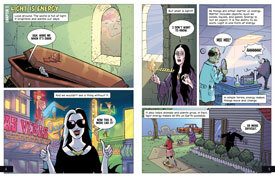 Books have comic book style illustrations. Chapters include: Methods to the Madness, Pondering Questions, Designing Experiments, Light for Life, and The End or Just the Beginning. Chapters include: What is Sound?, Picking apart Sound, Sound on the Move, Making Sound, Hearing Sound, and Sound All Around. 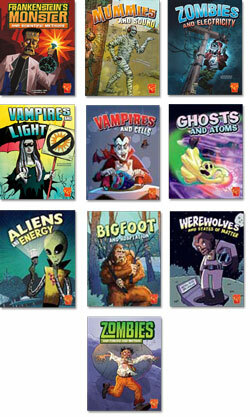 Chapters include: Energy and Matter, Kinds of Energy, Changing Energy, and Using and Saving Energy. Chapters include: What are Adaptations?, Physical Adaptations, Behavioral Adaptations, and Environments and Adaptations. Chapters include: The Tiny World of Atoms, The Current Atom Model, Elements and Molecules, and Studying Atoms and Molecules. Chapters include: Building Blocks of Life, Cells Working Together, Cells Up Close, and Cells in Action. Chapters include: Light is Energy, How Light Works, Characteristics of Light, and Light for Life. Chapters include: Matter all Around Us, States of Matter, Molecules and Atoms, Mixtures, and Reversible and Irreversible Changes. 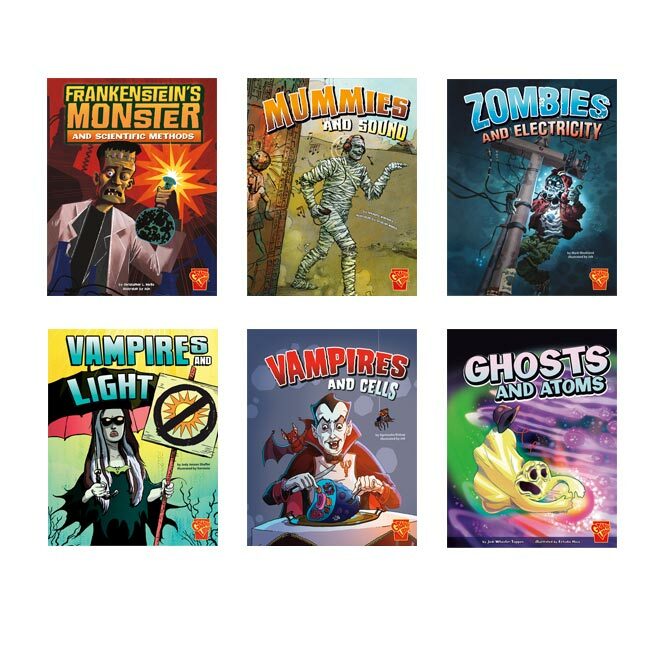 Chapters include: Electric Zombies, Charge?, Zombies and Current Events, Push, Pull, and Power Plants, and Safe from Zapping, Safe from Zombies. Chapters include: Zombies in Motion, Graveyard Gravity, Changing a Zombies Direction, Running with Zombies, Fleshing out Friction, and Zombie Action and Reaction.